What do you want? Delighted customers. How do you get them? By rapidly delivering innovative, exciting products and services your customers will love to use. How do you do this? By uniting talented people around shared ideas and purpose, trusting them, helping them take ownership, and getting out of their way. It sounds easy-but you know it isn't. To make it happen, you must create an agile culture: one that's open to change and can respond quickly to whatever your customers need and desire. 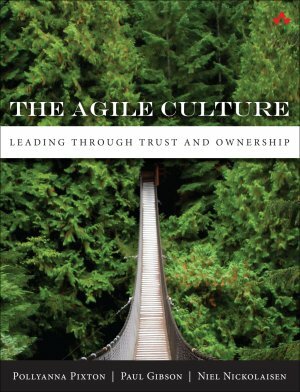 The Agile Culture gives you proven models, pragmatic tools, and handy worksheets for doing just that. Building on their experience helping hundreds of companies, three world-class experts help you align and unleash the talents of everyone in your organization. Step by step, you'll learn how to move toward a culture of trust, in which everyone knows, owns, and improves the results. You'll learn practical ways to refocus on differentiators and value, resurrect energy and innovation, deal more honestly with ambiguity and risk, and overcome resistance, no matter where it comes from. > Read excerpts, forward, about the authors, and order your hard copy or kindle version. Whether you’re leading an organization, a team, or a project, Stand Back and Deliver gives you the agile leadership tools you'’ll need to achieve breakthrough levels of performance. This book brings together immediately usable frameworks and step-by-step processes that help you focus all your efforts where they matter most: delivering business value and building competitive advantage. Discover how to use the authors’ Purpose Alignment Model to make better up-front decisions about where to invest limited resources–and how to filter out activities that don'’t drive market leadership. Learn how to collaborate in new ways that unleash your organization’s full talents for innovation. The authors offer models for understanding the unique challenges of any project and help you tailor your leadership approach to address them. View information to promote more effective, value-driven decision-making. Drawing on decades of experience working with great leaders, the authors focus on a critical issue you’'ll face over and over again: knowing when to step up and lead, and when to stand back and let your team produce results.